When it comes to comfort food, it’s pretty hard to beat good old spaghetti and meatballs. From romantic date-night meals to easy family dinners, this simple (but delicious!) dish has a way of improving life’s best moments. Better still, this time-honored meal is just about as affordable as it is tasty. As everyone who’s ever so much as spoken to a college student knows, pasta is dirt cheap — and the fixings don’t have to break the bank, either. But they don’t call us Penny Hoarders for nothing. We’re always looking for the best possible deal, and dinnertime is no exception. So we cooked up some money-saving tips to help you make your favorite pasta dish easier on the grocery budget. Here’s how to make spaghetti and meatballs even less expensive… and even better. So, how do we make this beloved, frugal staple even cheaper? Well, first of all, it helps if you already practice thrifty grocery shopping habits, like couponing and checking for cash-back rebates on apps like Ibotta. But what about for this dish, specifically? To make the meal as affordable as possible, we need to get the best price on each individual part. Let’s start at the bottom, shall we? Obviously, spaghetti noodles are pretty cheap: You can usually find a pound of dry pasta for about a buck and a half. With a two-ounce serving size (which yields about a cup once cooked), that means you’re looking at about 19 cents per plate. Not bad! But you can do better — and it’ll taste way better, too. Homemade pasta is so good it’ll make you wonder why you ever ate the dried stuff, and it costs literally cents to make. This basic recipe from The Prairie Homestead yields about a pound of fresh pasta, and calls for exactly four ingredients: flour, eggs, salt and water. You can buy a 10-pound bag of flour for less than $5, so this recipe uses about 14 cents’ worth. The water is free, and we’ll use about 1 cent worth of salt. And unless you buy the fanciest pasture-raised eggs produced by the most spoiled chickens in the business, you probably don’t spend more than $3 per dozen. That brings the total price of a pound of homemade pasta to just 90 cents, or 22.5 cents per generous 4-ounce serving. It’s true that the process of actually making the pasta is fairly labor-intensive. Rolling dough takes a lot more time and effort than simply opening a box. But seriously — seriously — trust me on this. Do yourself the culinary favor of eating freshly made pasta. It’ll blow your mind. I don’t know about you, but I’ve spent an inordinate portion of my life pacing the pasta sauce aisle, at a loss for which one to choose — and totally shocked that a single jar can cost up to $10! A basic red sauce, at its heart, is simply a mix of tomatoes and Italian spices. You may already have everything you need to whip one together in your kitchen: tomatoes (canned or fresh), garlic (or garlic powder), salt and maybe some sugar. Other popular ingredients are nearly as inexpensive: dried thyme, oregano, parsley, red pepper flakes and Worcestershire sauce appear in many recipes. If you want to be fancy, you might spring for red wine, fresh basil or a sauteed onion. Of course, spaghetti sauce recipes can be much more complicated, but you might be surprised what you can make with what you already have. The biggest investment is likely the tomatoes, which cost less than $2 for a big can. You can always skip the work and go for the bargain jar, which sometimes costs even less than dried pasta… but won’t measure up to even the simplest homemade sauce, taste-wise. Your best bet? Check out your pantry (and garden!) and compare what you have to your favorite recipe. Don’t be afraid to improvise. It’s comfort food — it’s supposed to be rustic! Hearty, stick-to-your-ribs meatballs are the star of this dish, and certainly its priciest component. But never fear. You can have your meatballs and eat them, too. Most meatball recipes call for ground meat, garlic, onions, spices, and binding agent like eggs, bread crumbs and milk. Just as with the other ingredients, the vast majority of those components are pretty darn cheap. But the meat itself is a different story. Ground beef isn’t prohibitively expensive, but let’s say you buy a one-pound package of lean beef for $5. Considering the pasta and sauce alone cost just 51.5 cents per serving, adding a 4-ounce serving of meatballs could raise the price of the dish to $1.77 per serving — an increase of more than 340%. So what’s a hungry Penny Hoarder to do? Luckily, there are lots of ways to save money on meat. In fact, it might be as simple as switching to a different animal — ground pork and even ground turkey are sometimes less expensive than super-lean ground beef, and arguably better for you. You could also buy a fattier package of ground beef (like 80/20), which tends to be cheaper, but since some of that fat will drain off in cooking, you’ll be left with less meat in your final product. Or you might try your luck at a discount chain or ethnic grocery store, where prices tend to be lower overall. But if you want to get serious about saving money on meatballs, the best way is to buy larger chunks of the animal at wholesale prices and then grind it down yourself, or ask your butcher nicely. That KitchenAid mixer you bought on Black Friday can fit a convenient meat-grinding attachment. It’s not as scary as it seems! It might sound intense, but you’ll have a lot more control over the quality of meat in your finished product — and if you have the freezer space for it, buying meat in bulk will save you money on more than just spaghetti night. You could also — *gasp* — go for homemade meatless meatballs. Tons of amazing, creative vegetarian meatball recipes replace meat with everything from quinoa to eggplant to cauliflower. And since they all omit the most expensive ingredient, you’ll save some pennies and a life. Now that we’ve laid the groundwork for getting the best deal on every component of your go-to Friday night comfort food, here’s our very favorite, knock-your-socks-off, super-thrifty spaghetti and meatballs recipe. Note: We’ve included a classic meatball recipe… But even if you’re a die-hard carnivore, don’t be afraid to give alternative meatballs a try. You might just be surprised by how much you like them — and your wallet certainly won’t complain! This recipe is adapted from those shared by our friends at The Prairie Homestead, Budget Bytes and Carla at Food.com. It serves four people for about $3 per serving, and takes about 70 minutes from start to finish. About $8.83-$10.83 for the meal, or $2.20-$2.71 per serving. Add the remaining ingredients and allow to simmer, loosely covered, for about an hour, stirring occasionally. Adjust seasoning to taste. Knead the dough well: The better-incorporated it is, the smoother your pasta will be. Once it’s assembled, smooth and satiny, roll the dough into a log and wrap it tightly in plastic wrap. Allow it to rest at room temperature for at least 30 minutes. Now, begin your meatballs. Heat the oven to 400 degrees F. Mix all ingredients by hand in a large bowl until they come together. Shape into 1-1/2 inch balls and place evenly on a large baking sheet or pan. (Meatballs will drain, so line the pan with aluminum foil to catch the drippings!) Bake uncovered for about 25 minutes, until light brown. While your meatballs bake and your sauce simmers, roll out and cook your pasta. Bring a large pot of salted water to boil. Then, cut the log of rested dough into smaller sections to make the process easier. Roll the dough using a pasta roller or by hand, ensuring it’s thin and even. If working with a rolling pin, start from the inside and move out toward the edges. Cut the dough into thin, even strips using a knife or a mixer attachment. 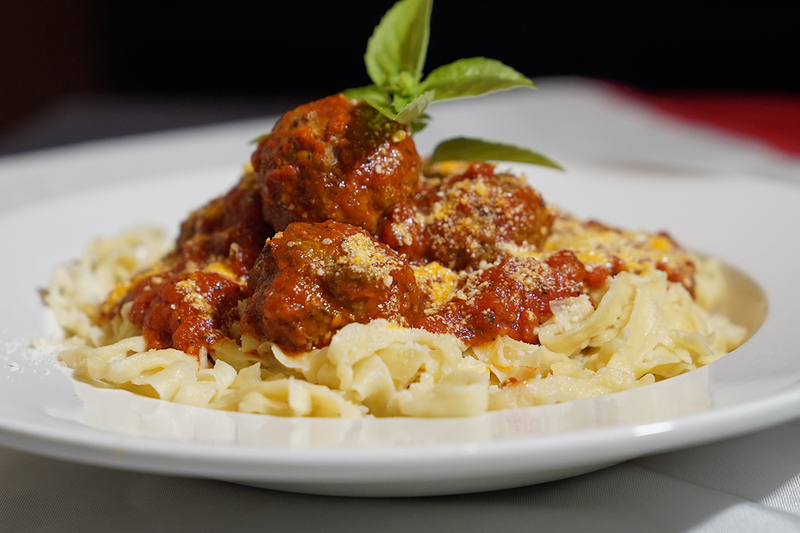 Ladle marinara and meatballs onto the pasta and garnish with a fresh-grated hard Italian cheese, like Parmesan. Pair with a good, cheap wine — which you can score for less than $15 per bottle, or $3 per 5-ounce serving — and toast to living the good life for just $3 a plate. Your Turn: What’s your favorite spaghetti and meatballs recipe? How do you make it as affordable as possible? Let us know in the comments! Jamie Cattanach’s work has been featured at Roads & Kingdoms, the BUST blog, Ms. Magazine, The Write Life and elsewhere. You can learn more and wave hello on Twitter: @jamiecattanach.